Skin, Hair, & Cosmetology In Delhi. One Of The Best Technologies in Delhi. Call Best Dermatologist In Delhi. Treatment And Successful Hair Transplant In Delhi. Call Skin Specialist In Delhi. Advanced Laser Treatment In Delhi. Call Dermatologist In New Delhi. With One Of The Best Therapies In Delhi. We are one of the best dermatologist in Delhi for Skin and Hair problems. We are equipped with best lasers and latest technologies for Hair Transplant, hair therapies, vitiligo treatments and Melasma or other pigmentary disorder's treatment. We give the best service to make your skin and hair look great, under the expert guidance of Dr. Sandesh Gupta. Dermatologist in Delhi provides highest level of skin and hair treatment at very affordable price. Expert dermatologists treating skin disorders through laser and latest technologies. If you are looking for the best "Dermatologist In Delhi" or Skin Doctor or Skin Specialist In Delhi, then you are on the right place i.e. 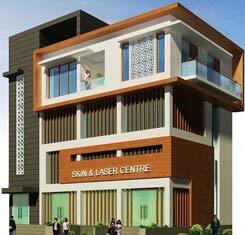 SKIN N LASER CENTRE, DELHI. Dr. Sandesh Gupta is an established Cosmetologist and Dermatologist in Delhi. He has done M.B.B.S from LLRM (Government medical college, Meerut ) and completed his Post Graduation (D.V.D.) in Dermatology from KMC, Manipal. He further got a master degree in aesthetic medicine and laser therapy from Singapore. 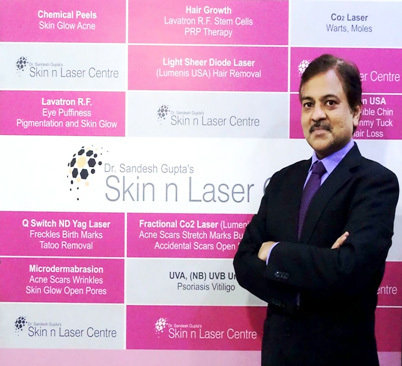 With a wide experience of 15 years in managing both dermatological and cosmetological problems, currently he is the founder and the owner of the skin and laser centre (one of the most advanced skin clinic in Delhi). Welcome to our Skin & Laser Centre, a specialized cosmetology & Laser centre committed to provide a standard quality of services at very affordable price. Skin & Laser Centre is one of the most well equipped cosmetology and Laser centre in Delhi. Established in 2003, our Centre has been providing highest quality of Dermatology services and laser treatments in Delhi. Make An Appointment With Dermatologist In Delhi. Skin & Laser Centre offers a wide range of services using non invasive and highly effective treatments from Hair Transplant, Laser Hair Removal, Vitiligo Treatment, Cosmetic Surgery, Lavatron (RF) Diathermy Therapy, Chemical Peel, Fractional CO2 Laser, Dermaroller & Mesotherapy, Q Switch Nd Yag laser, Conventional Co2 Laser, Melasma or Pigmentation, Botox & Fillers and advanced anti-ageing procedures. We provide all kind of skin laser treatments in Delhi NCR. Melasma is a chronic skin disorder that results in symmetrical.